Enthusiastic otter viewer: I saw a Sea Otter on the dock! Me: How wonderful but . . . it wasn’t a Sea Otter. Otter viewer: Yes it was, it came out of the ocean and was running on the dock. Me: Isn’t that wonderful but . . . that was a River Otter NOT a Sea Otter. River Otters live in the sea too. It’s really unfortunate that their common name is “River Otter”. It confuses people. Sea Otters can’t run. They are adapted to be in the ocean so their hind limbs are like paddles and, since they so rarely are on land, their front paws are adapted to be really dexterous and use tools. Otter viewer: But it was in the sea!!!! Ah yes, how I would like to find whoever was responsible for the common name “River Otter”. Click the image below to enlarge a table of some of the key differences between River Otters and Sea Otters. The otter illustrations are by Uko Gorter Natural History Illustrations. Click to enlarge. 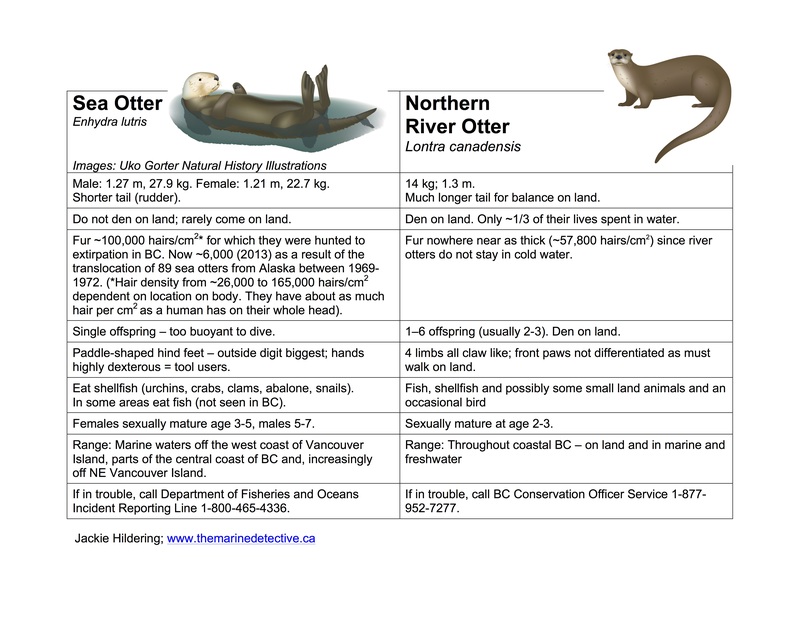 Table showing differences between Sea Otters and River Otters (by Hildering). Updated 2015-05-24. What has stimulated my sharing this with you is that, this year, we have the great privilege of having a mother River Otter and her six pups delighting us in Telegraph Cove, B.C. Today, I had the chance to get some photos of them. Below, see some of these images, including a little slide show. Yes, they are otterly adorable even though they add colour and odour to my days by pooping on the lines of my boat and leaving bits of fish for me to slip on . . . as well as stimulating all those “I saw a Sea Otter” conversations! Mama River Otter and most of her brood of six. Photo: Hildering. Mama River Otter jumping back into the ocean. Note her reflection in the water. Photo: Hildering.